Have you ever finished a project only to realize it is just so-so? It’s alright but nothing special? Or it’s not your style? Or the holy grail of sewing slip ups – it doesn’t fit? A long time ago I made a simple reversible wrap skirt (one of the first sewing projects that made it onto this blog, eek! look at that long hair! wow, that was back at my very first apartment by myself! sorry – nostalgic tangent…) which, while I was proud of it at the time, I soon realized that the skirt contained bits of each sad characteristic I mentioned earlier. It never fit on my waist the way I wanted it to, it was heavy and stiff (even though the two fabrics individually were not), and most importantly it wasn’t really my style. So it sat lonely in my closet until now. Wow, three years is a long time to never be worn! Seriously, I don’t think I ever wore it except to take those pictures. I decided make something better from it and delicately ripped out the seams. Then I took the main section with the red and navy (what looks to be) flag design and turned it into this button front skirt. I gathered the waist slightly and folded the original waist band over to make a new skinner band for skirt 2.0. I had a set of buttons leftover from another project but I needed more so I bought one more set. Hey, at least I used up part of my stash! Speaking of stash busting and reusing materials – for the lining of the new skirt (the fabric was so see-through that I had to have a lining) I cut off the lining of an old, never worn dress. Although that dress was store bought it suffered from the same problems mentioned at the top of the post. Even though the lining is black it still works for the skirt. I still have the denim section of the skirt left but I’m unsure what to do with it. Maybe make some shorts? Whatever I do, I’m leaning towards dying the fabric because the bright blue color is a little too 90s mom jeans for me. 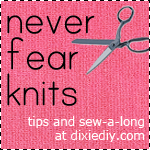 ***Quick note I wanted to share: have you ever gone back and taken a close inspection of your older sewing projects? Can you tell how much you have improved? As I was seam ripping I kept wondering to myself, “Why did I stitch over this part twice? And why are these seams so uneven? And why is this section so lumpy?” etc. I want to go back and ask 2008 Dixie what she was thinking while she made this skirt. I wonder if 2008 Dixie would like the 2011 version of it better?